Note: the Lab is BYOD - it does not have an instructor computer installed, so please bring your own device. 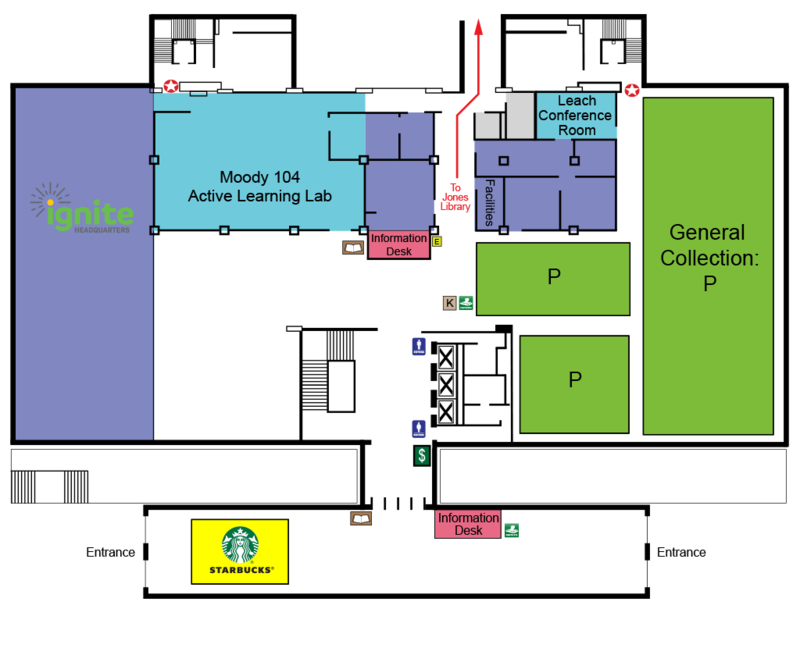 The Moody Active Learning Lab is located on the first floor of Moody Library, immediately to the left of the Main (Circulation) Desk. The primary purpose of this space is for classes that use active learning methods. The room was built according to established criteria for active learning spaces, and the space design, furniture, and technology work together to support active learning approaches like group work, pair-share, and flipping the classroom. The Active Learning Lab encourages experimentation with a wide variety of teaching and learning strategies. The standard layout seats up to 56 students in active learning mode. The layout organizes students into Learning Pods. Each Pod has seating for 7, accessible power, a wireless display, and a mobile glass writing surface. The instructor table, located in the center of the room, is height-adjustable with built-in power, HDMI, and touch panel. The Lab is powered by sophisticated AV technology that allows any input to be sent to any display. Silver AV ports around the room allow you to rearrange the displays. Independent Display mode allows each pod to display small group content independently while Unified Display mode shows instructor content on all connected displays. In Independent Display mode, learners can present wirelessly from personal devices including laptops, iPhone, iPads, and Android. Wireless presentation is powered by Mersive Solstice. Instructions to connect are shown on each pod display.